Founded just six months after the tragic invasion of Cyprus as an athletic team of Cypriots players living and studying in America, caring about their divided and occupied country, the Pancyprian Association “walked” for 40 years the path of the struggle for freedom in Cyprus. Very soon the association got involved in every effort of the Greek American Community to preserve the U.S. arms embargo to Turkey. In 1977 the Pancyprian Community Center was purchased serving as the headquarters for political fundraisers and cultural events. Today the Pancyprian has five divisions: Athletic, Youth Athletic (Eleftheria – Pancyprian), Cultural (with Choir and Philharmonic), Dance and Women’s Issues Network. These 40 years of struggle for Cyprus and continuous effort for the Cypriot Community in the United States is celebrated on Wednesday, March 9, 2016, at 6 pm, with a gala dinner at the New York Hilton Midtown (1335 Avenue of the Americas New York, NY 10019). The organization is honoring with the “Lifetime Achievement Award” one of its founding members, Constantine (Dinos) Iordanou, Chairman of the Board of Arch Capital. Philip Christopher, the president of the Pancyprian all these years and a legendary figure of the struggle of World Hellenism for freedom in Cyprus, spoke to the Greek News about the history of the association and its present and future. Q: The Pancyprian Association celebrates its 40th Anniversary. I could say 40 years of worthy accomplishments in the national, political, social and cultural fields…. A: The PanCyprian Association of America, which was organized 6 months after the tragic invasion of Cyprus, its history of 40 years is closely related to the history of the Republic of Cyprus. 40 years ago we started as a soccer team and it’s amazing how from a team of 11 soccer players projecting Cyprus we are here today. The team wrote a tremendous history over the past 40 years, with 6 U.S. national championship cups. Dino Iordanou, who we are honoring, was in the original team along with many of the other founders of the organization. Out team as the U.S. Champions has represented the United States in Mexico, in Bermuda, in Honduras the CONCAF. The other thing we proud of is the many scholarships we have offered to athletes; young men who became doctors, lawyers etc. I’m particularly proud of three doctors, Dr. Michael Iordanou, Dr. Christos Christou in Cyprus and Dr. Andreas Rotsides. The many young players that got educated and returned to Cyprus and every time we go to Cyprus we are very proud to see more than 200 scientists, teachers and professionals that have enrolled into the society of Cyprus. From there we founded the Dance Division, with the purpose of spreading the folk songs and folk dances. They participated in the inauguration of President Carter, they performed in the Kennedy Center in 1980, in the Cultural Olympics of 1984, they went to different universities. Today the Dance Division is headed by Kyriakos Papastylianou. Followed by the Athletic Youth “Eleftheria – PanCyprian”; Over 200 kids from 6 – 18 years old playing soccer. They are visiting Cyprus every year and they are keeping the traditions. Followed by the Pancyprian Choir, which promotes the music and the songs Cyprus. We also have the Cultural Division and the Pancyprian Philharmonic, which marches every year in our National Greek Parade and 5th Avenue and you will have the opportunity to see this year, on April 10. The Women’s Division (WIN), headed by Dr. Dia Christodoulidou, an organization that provides help to women, such as free PAP tests and mastography screenings etc and they present the “Woman of the Year Award” every year. So, I am particularly proud. In 1977 we purchased our Community Center, which may not be big enough, but we are proud of the fact Senator Biden was here, Senator Sarbanes, many other Senators and many Congressmen were hosted. Also every President of the Republic of Cyprus visited the PanCyprian Community Center and every visiting Minister here passes by. It is the place where all the meetings of the Federation, the PanCyprian’s Divisions and other members have take place. On top of that, I am proud of the expansion, particularly the PanCyprians of Florida and the PanCyprians of Washington that are very active. We are continuing to look for ways to bring about a formula that embraces our political action along with maintaining our heritage and our roots. Q: Who is this year’s honoree? A: In the past we used to have the Freedom Award, with prominent recipients like George Tenet, Michael Dukakis and John Brademas. We also had another Greek-Cypriot honored, Nikos Mouyiaris, who has been a strong benefactor for our association and Hellenism. This year we are honoring a man who started with us as a young soccer player and today is the Chairman and CEO of Arch Capital, one of the biggest insurance companies. We are honoring him in particular because he has never forgotten his roots. He has been a trustee of our association from day one and as CEO of Arch, for the fact that he went to Cyprus and opened an office there employing 20 Greek Cypriots, just to show what can be done and hopefully other companies will follow. We established the Lifetime Achievement Award, which is an award that will be given every year to a Greek Cypriot who has attained that kind of achievement. We have many with these qualities and we have to be very proud of Greek Cypriots, whether is Andreas Kramvis at Honeywell, or Chris Nikias the President of USC. We have to remember that Greek Cypriots make 55 – 60,000 people in the United States, but we always thought we were a part of the 2 million Greek Americans. We are very proud of our activities and what we do. So, as we celebrate today, in a very critical time that Cyprus is coming through, our commitment is that we will continue to fight for justice for Cyprus until we finally see a united and free island. Out of the 550 people we are expecting to be at the event, approximately 50% will be non-Greeks. We will have insurance brokers and business people. What is interesting is that this will probably be the biggest financial success of the dance of the PanCyprian dance. The purpose of the event is to pay-off the loan on this building and to use the balance as a building fund, either for the expansion of this building or for finding a new building. So, I am very thankful to Dinos Iordanou and Nick Karakostas who is Chairman of the Event, for pushing to get this. This is a life time achievement award and well deserved and we look forward to a success on March 9. A: Absolutely! Our biggest success has been that, not only as Greek Cypriot community, but also as Greek American Community. Even today the lobbying for Greece is done mostly by the Greek Cypriots. But I have to give a lot of credit to people like George Livanos, and the Andy Athens, who worked with me for so many years. But, just having those fundraisers week after week here for so many years, people learned what it was about. 2016 is an election year in the United States. I am already looking and speaking to the Republican side. Of course we know where Hillary Clinton stands and I am not even going to spend time; Sanders certainly has to learn, because as a Senator he hasn’t voted always with us, I don’t know why, but anyway, I wouldn’t have given him an A. He had his pro-Turkish moments for some reason. But he has to learn and if he learns he will be okay. On the Republican side, the very conservative Republicans are usually pro-Turkish, but Marco Rubio has a very good understanding on the Cyprus issue and we have to educate him more. Of course I have to educate Donald Trump, if I could get to him, because he is the kind of guy that if he gets educated he calls things the way they are. Q: What do you recall as a really great moment of the PanCyprian? A: Well, I think from the athletic point of view our trips outside the United States; having the Ambassador of the United States with the American flag coming and receiving the team and congratulating us. I also remember the trips to Cyprus. The fact that in one of the games Mimis Domazos, Mimis Papaioanou, Koudas played in the field, along with Dr Lakis Nicolaou! We are talking about the best three players in the history of Greek soccer. I think another great moment was the inauguration of this building, which was achieved relatively quickly from when we started. President of Cyprus Spyros Kyprianou was at the inauguration. Q: Compiling all the various activities and for you especially, one minute to speak about the Cyprus problem, the other to talk about the soccer championship and then about all the other cultural events. How do you bind all these things together? A: I think that was the key! If you look at our five divisions today, they are completely independent. Each division has a president and a committee; they have their own accounts, their own treasury. They work independently and I’m very proud of what our divisions have achieved. Our dance division with Kyriakos Papastylianou has done amazing work. The athletic division, with Nick Tziazias and the Youth. Dr. Dia Christodoulidou with WIN and Ismini Michailidis with the Choir. They all have done some amazing things. I am very proud of them. I feel very comfortable retiring and the Board of Directors of the PanCyprian assuming everything and having those divisions. One of the things that I would like to do is to expand the PanCyprians. We are starting PanCyprians of Staten Island as a division and we hope to have it by the end of the year. I also went to California, where there is a group of people interested. And I think we will have PanCyprians of Los Angeles very quickly. Q: How do you see the future of the organization? You say you will be retiring for the past 5 years, but how do you see—and I am not talking about you only—but how do you see the young generation? A: Exactly, it works. I am looking at it as a result of how the AHEPA Chapters run. Even if it’s a hundred members in a particular situation, if these members are active they can accomplish important things, whether it’s with a Congressman or a Senator or so on. I was speaking recently to Marco Rubio’s campaign. I said, listen, we have 50,000 votes of Greeks in Florida that we can influence. These 50,000 votes can be produced on the Republican side in Bilirakis’ district and other areas, but we have to make it worth something, because Florida is going to be a key state in the presidential elections. Constantine Iordanou is the Chairman of the Board of Arch Capital Group Ltd. and its president and chief executive officer. Prior to joining Arch as one of its founders, Mr. Iordanou held senior executive positions with American International Group, Berkshire Hathaway, and Zurich Financial Services, and currently serves as a Director of Verisk Analytics, Inc. (formerly ISO Inc.). During his 39 years in the Insurance Business, he has held leadership positions with industry associations serving as the past chairman of the American Insurance Association (AIA) and Association of Bermuda Insurers and Reinsurers (ABIR). Mr. Iordanou is married to Marianne and they have three children. Mr. and Mrs. Iordanou have dedicated their charitable activities to education, serving as trustees at the Holy Child Academy, Our Lady of Mercy Academy, Roosevelt University, and the College of Insurance. 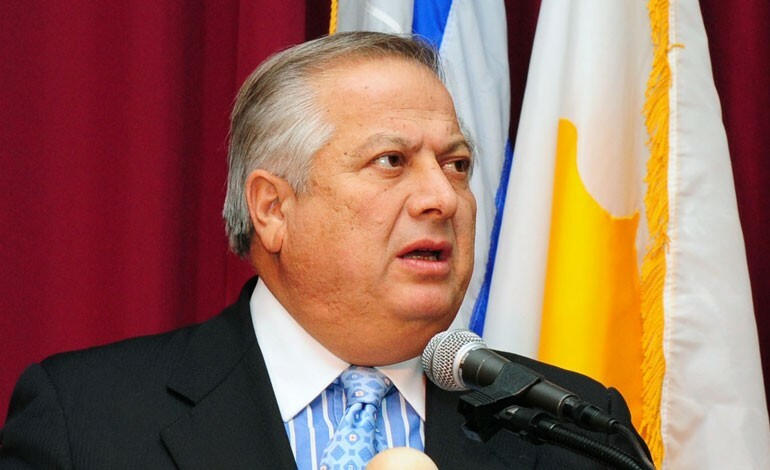 As an ethnic Greek Cypriot, Mr. Iordanou was a founding member of seven lifetime trustees of the Pancyprian Association of America, established in 1975. He is also a founding member of FAITH, a charitable organization dedicated to the advancement of Greek-Americans through education. He holds an aerospace engineering degree from New York University.